Lily of the valley (Convallaria majalis) is a flower of my childhood. It flourished in and around a revolutionary war-era cemetery near my home in New England. I associate the flower with Mother’s Day, because by that time in May it was usually in bloom. When it was, I would pick handfuls and bring them back to my mother as a present. I associate their sweet, heady fragrance with those days. It’s the birth flower for the month of May. In the language of flowers, it stands for sweetness, humility, and ‘a return to happiness’. Despite the name, it’s not a lily, or in the lily family, though it was once thought to be. It’s part of the huge Asparagaceae family (which includes asparagus), and belongs to the subfamily that includes Liriope (lilyturf) and Polygonatum (Solomon’s seal). As a gardener I learned to appreciate lily of the valley for other reasons. It can take a licking and keep on ticking. It flowers in part shade or heavy shade. It grows under trees. It enthusiastically colonizes (too enthusiastically, for some tastes), creating a low maintenance groundcover. It will thrive in clay. Deer and rabbits don’t eat it. All the parts are toxic to people and pets, so do not ingest even if the flowers do smell good enough to eat. 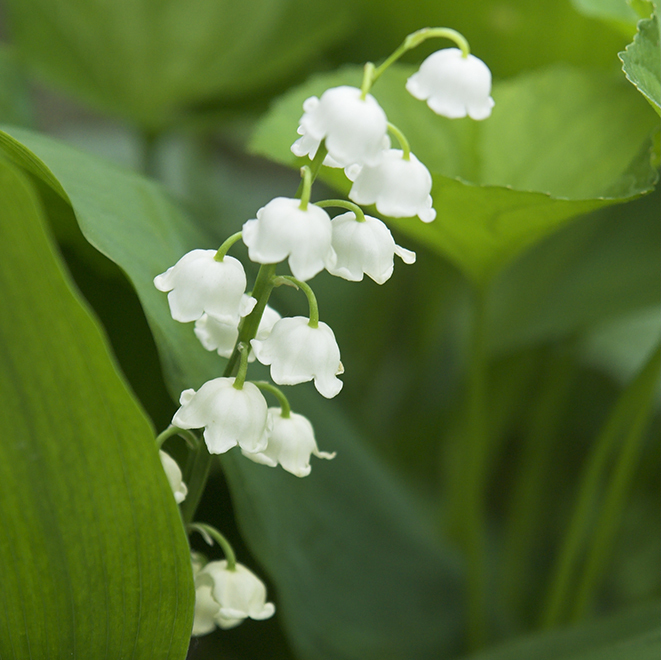 Lily of the valley is a deciduous perennial that’s hardy in USDA Plant Hardiness Zones 3 – 8. The plants grow to 8 or 9 inches tall, and prefer rich, humus-y soil and consistent moisture: what might be called woodland conditions. 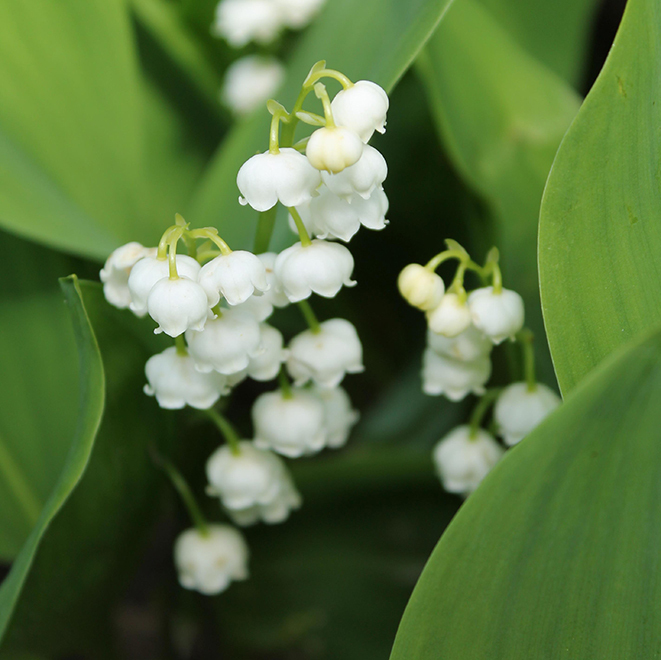 Though the flowers produce red berries, lily of the valley spreads by rhizomes. I’ve never purchased lily of the valley plants. Friends and neighbors are only too willing to let me cull their rampant herds. That’s how I got my most recent clump, which has pink flowers. Lily of the valley flowers are usually white, but these, growing outside a 150-year old stone house in Philadelphia, were a soft pink. I liberated as many as I could. They can be tough to dig up, but easy to replant, and take transplanting in stride. I’m pretty rough with mine; once established, I don’t water, feed or do much of anything, other than snip the flowers for bouquets. Some people think once it’s flowered the foliage is boring, but I just plant more interesting plants around it, and am grateful for whatever weed suppression it provides. I even like how the leaves turn gold in fall. Cultivars abound, include the green and white striped ‘Albostriata’. ‘Aureovariegata’ has yellow striped leaves. ‘Albomarginata’ has leaves with white edges. Two cultivars with gold-edged leaves are ‘Cream Da Mint’ and ‘Hardwick Hall’. ‘Fortin’s Giant’ has larger flowers and longer stems. ‘Rosea’ has the pinks bells. ‘Floro Pleno’ has double flowers. So between the different foliage and the flowers, there are many ways to enjoy this dependable, old-fashioned flower. I would become an avid lily of the valley collector, but for my wallet. It appears that the cultivars start at about $16 per plant. For someone used to digging up and moving dozens with a garden fork, with only the blessing of the gardener whose colony I’m reducing, that’s a tad rich for my blood. So I remind myself it’s the flowers that matter, and the plain, garden-variety species smells as sweet as any flashier cousin. Therese Ciesinski is the editor of GardenSMART’s In The Dirt Newsletter. She writes about gardening, interior design, organics, the environment, people, and pets for national print and digital publications, including Garden Design, This Old House, and Vegetarian Times magazines, the Philadelphia Inquirer newspaper, and Houzz.com. An editor at Organic Gardening magazine for many years, Therese has given seminars and lectures at flower shows and garden clubs across the country, and has appeared on television and radio. She lives in southeastern Pennsylvania.